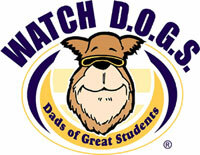 WATCH D.O.G.S.® (Dads of Great Students), a K-12 program, invites fathers and male figures to volunteer at least one day, all day, at their child’s school. The purpose is to provide an adult male volunteer every school day. WATCH D.O.G.S. volunteers help to provide a safe environment and serve as a positive male role model. The program is overseen by a “Top Dog” volunteer who partners with the school administrator to coordinate scheduling and identify opportunities for WATCH D.O.G.S. to provide assistance at the school. WATCH D.O.G.S. volunteers perform a variety of tasks during their volunteer day, including monitoring the school entrance, assisting with unloading/loading of buses and cars, monitoring the lunch room, or helping in the classroom with a teacher’s guidance by working with small groups of students on homework, flashcards, or spelling. Dads, please consider offering your time, expertise, and talent to work together to build on the high quality of education offered at Prospect Valley.